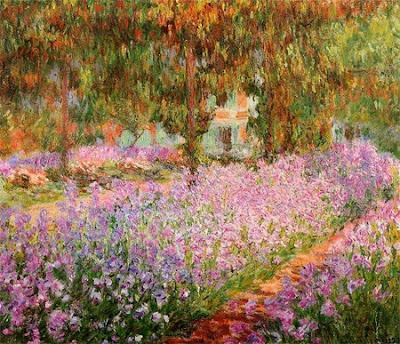 I love this painting and the dreamy look of Monet's gardens. I've been wanting to make a quilt that has this same feeling. Gail's vintage sheet swap over at Crafty Little Beana's (thanks Gail!) was an opportunity to collect more floral sheets. I got some good ones that fit this project. Thanks to everyone who contributed! The good thing...one fat quarter makes one row of zig zag. Isn't that the best! I have tried a bunch and rejected lots...you should see my reject pile. They have to have just the right feeling to fit. I have 12 rows of zig zags right now. I'm still auditioning...moving around...trying and retrying. I cut the squares into triangles to help me get the real feel of the quilt. Probably a mistake...so no half square triangles...just lots of single triangles to sew together....someday. Elizabeth of Oh Fransson has made a beautiful top with this pattern and her vintage sheets. It's beautiful. Mine isn't there yet. I'm still deciding whether I want to sew all those triangles. I'm thinking about trying a different pattern too. Sorry about the picture...it's dark and dreary here. The colors are sooooooo breath-taking! So looking forward to seeing what you have put together -- from the looks of it -- it promises to be positively beautiful! LOVE the colors! Isn't it wonderful to have a place to audition your pieces and stand back and have a look. I have not worked with sheets yet but it could happen in my future with all the inspiring projects I'm seeing. Try a size 70 Microtex or denim needle when you are sewing the triangles and grab hold of the thread behind the foot to get the first pair started through. Most people start out with a fatter seam allowance at the beginning of the seam and let go of the fabric too soon at the end, and it makes the end of the seam narrower. Concentrate on hanging on right to the end and you won't have any problems. Gorgeous! And so inspiring. I can't wait to see the finished product. It looks pretty spectacular to me - I can't wait to see the finished quilt. Oh, this will be so pretty, and well worth the effort, I'm sure! It looks really good! I like all the different florals together. What a great idea. I can't wait to see your finished product. It is going to be lovely. how absolutely fabulous...i am in awe of the things you create...=)...thank you always for the inspiration...that's a fancy way of saying i want to be your copy-cat!!!!! What a cool idea!!! Looks to me like cutting/sewing parallelograms are about as challenging as triangles - maybe I'm missing something. Would triangles give a finer point to the color splash? I think it looks magnifique as Claude might parle. Terrific quilt! Really beautiful. Isn't it great to be inspired by something your really love. WOW! It’s becoming a wonderful flower garden quilt! Thanks for the shout out! I love the fabrics you've chosen. I also want to second the suggestion to use a Microtex/Sharp needle to sew sheets. It really makes a difference on the thinner cotton/poly blends. We are so alike Jacquie. I've wanted to do a Monet Garden type quilt for a while too. I'll let you go first! I spent some weekend time on those blocks. I did some unpicking and some cutting. I don't want you to regret giving them to me! Gosh, I am always so inspired when I visit your blog. You make me want to spend all of my hours quilting! It is certainly looking lovely! But the thought of sewing all of the triangles together . . . ugh. But I know YOU can do it! I might have to try exuberant color's tips. There is such a vibrancy in his paintings, and for me, a lot of lovely liquid movement. What a perfect inspirational piece for one of your quilts. I know that you will create a beauty, deserving of its magical seed of inspiration! Can't wait to see what you end up making. Those vintage sheets are so so beautiful! Oh I recognize a lot of those florals :) It looks beautiful! Looks beautiful! I can definitely see the Monet inspiration! I love how this looks -- can't wait to see it all together. It really does look very dreamy and definitely very Impressionist! I can't find flowery sheets here in england... not thrifted ones anyway. only horrible synthetic ones in shades of orange and brown. or grey and black (grey and black bedding? how depressing!!)... yuk. This is so pretty! I'm still looking for inspiration to use my fat quarters from that swap - will have to remember this! This looks beautiful! I love the florals and those colors - wow! I can't wait to see it finished! Oh, my goodness, this is beautiful! I can just imagine how soft it will be, it's wonderful. I have never found sheets like that anywhere. That quilt is beautiful! Can't wait to see what you do. well, to me it looks busy...but I'm not sure how to make it better....well, actually I am, but you'd HATE IT so I won't say it. what a great idea to make a monet inspried quilt! I think you are on the right track. It is beautiful. I've done some colorwash quilts before and I thought that technique reminded me of Monet paintings.Great for using florals and designing landscapes. This is such a great idea! I took part in this sheet swap too and I don't know what I'm going to do yet...this is inspiring me to get started! I love this quilt! You are an artist with fabric!